Anchorage Chamber of Commerce Gold Pan Award’s presented the 2018 Chairman’s Award to Eklutna, Inc.! The Anchorage Chamber Gold Pan Awards is one of the organization’s longest-running civic programs. It was established in 1957 as Anchorage’s number 1 premier business awards event. 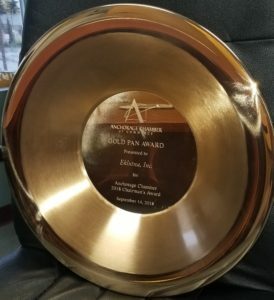 For 61 years, Gold Pan Awards have been awarded to those who have shown business and entrepreneurial excellence, as well as a loyal commitment to Anchorage through community service. With a massive hurdle to fish passage in he Eklutna River now gone, it’s up to local utilities to take the next step toward restoring the river to its natural state. In the first week of August, a yearlong project to remove an abandoned diversion dam in the Eklutna River Valley completed. Although the dam removal hasn’t restored water flow into the river, it’s a major step towards returning the 22-mile stretch of prime salmon habitat to its natural state. Gone is the massive crane used to remove the 61-foot concrete dam, as well as hundreds of thousads of cubic yards of sediment that had accumulated over more than six decades of neglect. The $7.5 million Eklutna River dam removal project initiated in September 2016 was completed this summer, according to Brad Meiklejohn, Alaska State Director of the Conservation Fund – a private and non-profit organization. Eklutna Inc. provided the land for the project and our subsidiary, Eklutna Construction and Maintenance, LLC was contracted for design and construction by CITC. A student from New Jersey became a key cultural resource for Alaskan Natives. For 40 years, Jim Fall has voraciously gathered a record of indigenous life in precise, exhaustive state reports. He learned to speak the original language of the Anchorage area in a way hardly anyone else can. As the demolition of an abandoned Eklutna River dam moves forward, local utilities, lawmakers and business leaders are talking about the next step in the process – potentially restoring water and salmon to the 22-mile channel. Work advanced in May and June on removal of a concrete dam on the lower reaches of Eklutna River. 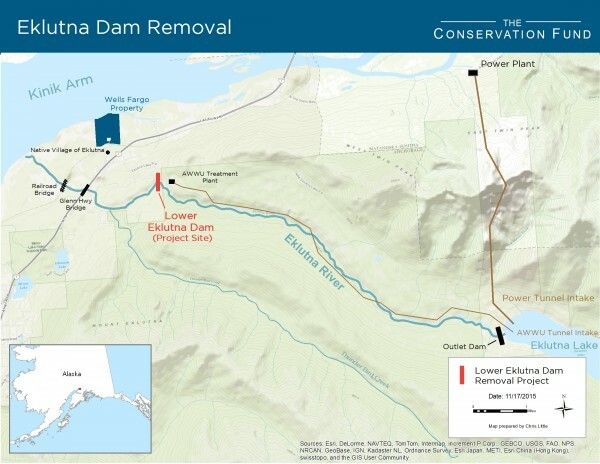 Started last summer, de-construction of the dam is the first phase of a $7.5 million project initiated by The Conservation Fund, in partnership with Eklutna, Inc., to rebuild the salmon runs that once existed in the river before 1929 when the dam was built. But there will be no explosives bringing the dam down, nor will there be any wrecking ball smashing the 70-foot-tall concrete structure apart, despite the on-site presence of the state’s largest crane. A $7.5 million project to remove a dam in Alaska is set to begin. The project to deconstruct a dam at an Eklutna River ravine to restore salmon populations on the river begins this month. The project largely will be funded by the Conservation Fund in a partnership with Eklutna Inc., an Anchorage real estate development company. Eklutna CEO Curtis McQueen said Monday at the Anchorage Chamber of Commerce forum it will take a 400-foot (122-meter) crane, the largest in the state, to handle the task of taking down the dam, which was built between 1927-29 by the Anchorage Light and Power Co.
Called the “Ernie Turner Center — Recovery Journey Program,” the new building will have 16 beds for short-term and long-term addiction patients. CITC is one of the partners on the project, along with Cook Inlet Housing Authority, a nonprofit housing developer, and Eklutna Inc., the Native village corporation and landowner. The Assembly also on Tuesday night unanimously approved an expansion of special zoning regulations for the Native Village of Eklutna on the northern edge of the municipality. In May 2014, the Assembly created a special zone that eased building restrictions for the village, the only Alaska Native village within Anchorage’s boundaries and the oldest continually inhabited Athabascan site in the region. The Assembly’s action, pushed for by Assemblyman Bill Starr of Chugiak-Eagle River, gave the tribal council and Eklutna Inc. – a village corporation established under the 1971 Alaska Native Claims Settlement Act- more control over development in a 802-acre parcel, such as allowing more than one home to be built on a property so several generations can live close to each other. On Tuesday, the Assembly supported adding another 157 acres to the parcel. The village got the land as a transfer from Wells Fargo Bank in December 2014. 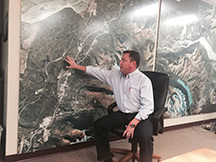 STAR PHOTO BY MARY LOCHNER – Curtis McQueen, CEO at Eklutna, Inc., points to a map of Chugiak-Eagle River as he talks about the Native corporation’s vision for land stewardship and development. Until recently, few people knew much about Anchorage’s original residents, the Dena’ina. Palmer, AK: On Friday, February 6, 2015, Matanuska Electric Association hosted the Eklutna, Inc. Board of Directors and management team for a tour of the recently completed Eklutna Generation Station. Eklutna Chief, Lee Stephen, made closing remarks stating, “I’m impressed with this new facility. My greatest wish is for a bright future and better jobs for our children and grandchildren.” The Chief then offered a heart-felt traditional blessing for the plant and its workers. lobby as well as a thank you plaque presented to Eklutna, Inc. at today’s meeting. from Eagle River to Talkeetna. Eklutna, Inc. permanently conserves lands for Shareholder subsistence hunting, fishing, recreation. Eklutna, Inc Partners with Great Land Trust on 3 Projects that conserves substantial area the size of 1000 football fields. December 4th, 2014 – Over 1,000 acres of Eklutna, Inc.-owned land used for subsistence hunting, fishing and berry-picking and containing high-quality salmon habitat and migratory bird habitat is now conserved for future generations of Eklutna people. Just before Thanksgiving, Great Land Trust and Eklutna, Inc. completed three projects that permanently conserved 1,329 acres of Eklutna, Inc.-owned lands. The lands will remain under Eklutna Inc. ownership and traditional use by Shareholders and public recreation access through permits will continue. The largest project, located east of Palmer, covers nearly 800 acres in the Jim, Mud and Swan Lake area and is home to excellent wetlands that provide important functions including filtering water, and storm water retention. The project area maintains critical spawning and overwintering habitat for the popular Jim Creek Coho salmon fishery, calving grounds where moose have their young, and rich habitat for wildlife species that make Alaska world-renown, including migratory waterfowl, beaver, swans, moose, bear, and wolves. The region is recognized by the Audubon Society as an Important Bird Area of state significance due to high concentrations of trumpeter swans. The other projects include the “Mink Creek Conservation Project” next to the Glenn Highway near Birchwood and the “Eagle River Greenbelt” near the mouth of the Eklutna River. All three projects were conserved by the sale of a conservation easement, a legal voluntary agreement between a landowner and a land trust that permanently restricts future development and subdivision on all of these lands. For each project, Great Land Trust is contributing to a fund that is accessible to Great Land Trust and Eklutna, Inc. for land management purposes. 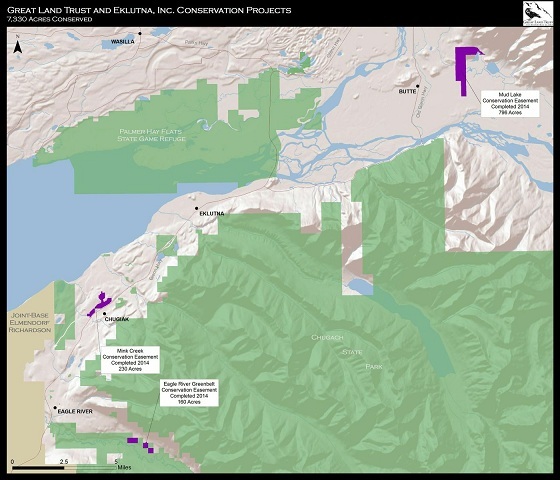 Both Great Land Trust and Eklutna, Inc. hope to hire Shareholders to help manage these unique lands. 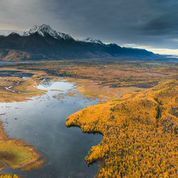 These three conservation projects join the Eklutna River Estuary, Fire Creek Estuary, and Knik River Islands, three Eklutna projects conserved by Great Land Trust in 2011. Together, GLT and Eklutna have conserved over 7,400 acres of land and waterways that contribute to Southcentral Alaska’s healthy community and strong economy. Great Land Trust has been working with willing landowners to conserve wetlands and other important lands and waterways in Southcentral Alaska since 1995. Eklutna, Inc. is the largest private landowner in the region and both organizations anticipate more conservation projects in the future. The projects were made possible through a collaborative effort with partners including The Conservation Fund, The Nature Conservancy, CIRI, the Mat-Su Salmon Partnership, U.S. Fish and Wildlife Service, the Army Corps of Engineers, NOAA Fisheries, and the Alaska Department of Fish and Game Sustainable Salmon Fund. Interested in Leasing? Click on the Artillery Park Industrial Shop Space tab under Corporate Lands Commercial & Industrial Section. 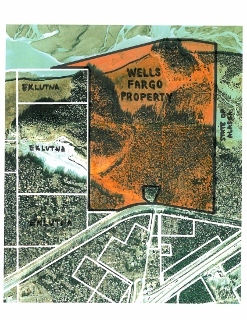 [Eklutna, Alaska, June 5, 2014] – Wells Fargo & Company (NYSE: WFC) is donating 143 acres of land adjacent to the Native Village of Eklutna to The Conservation Fund for permanent land and habitat preservation. The property is located approximately 25 miles northeast of Anchorage, in the heart of Dena’ina Athabascan country where Alaska Native people have lived for thousands of years. The land has cultural and historical significance to the Dena’ina people with traditional semi-subterranean dwellings (nichilq’a in Dena’ina Athabascan) and storage caches identified on the property. They are among the few remaining undisturbed Dena’ina habitations within the Municipality of Anchorage. The area remains a place for traditional subsistence activities such as hunting, fishing, and berry picking. Hills on the property are also revered as sacred grounds where ancestors’ ashes are spread. A unique granite formation on the land was the inspiration for the Native village’s name, Idlughetnu in Dena’ina Athabascan, which means river that flows by two hills. Wells Fargo has 850 team members in Alaska who serve customers through a network of 57 banking, mortgage and investment offices, and 115 ATMs, in 28 communities. We have some exciting news to announce! Through the hard work and successful actions of the Alaska Native Community, the National Congress of American Indians has selected Anchorage, Alaska as the host city for their 2014 Summer Meeting. For most Alaskans that are familiar with AFN which represents all Alaska Tribes, NCAI is AFN on Steroids representing all tribes of the United States, Hawaii & Alaska. An Alaskan committee comprised of multiple tribes led by the Kenaitze, are coordinating the NCAI Event. This group will be recognizing the indigenous tribe of Anchorage, the Eklutna Dena’ina, as the local host. Coinciding with NCAI, Eklutna, Inc. will be hosting the semi-annual at the traditional village site. This is a very important event for the Native Village of Eklutna. Eklutna, Inc. is a strong supporter of both events and will be working hard to help the Village of Eklutna raise funds for this historic endeavor. We are asking our fellow business partners, associates, and fellow Alaska business to donate monies towards this event. The Village is requesting donations as they prepare for their Bi-Annual Pow-Wow scheduled for June 7 and 8, 2014. The event will be held on Eklutna, Inc. land as it has been for several years. The Pow-Wow grounds are adjacent to the Eklutna gravel pit. The Pow-Wow is a great opportunity for the community to interact with the native community, Eklutna Village, and various artists, musicians and traditional dancing groups. The Village anticipates as many as 2500 people in attendance over the two-day event. The funds raised will support the purchase of food, transportation for Alaska Native dance groups, and rental equipment. This Pow-Wow will also be a way for the Native Village of Eklutna to share some of its Athabascan traditions and ceremonies with the general public. Parties are working with the Alaska Railroad to provide train rides from downtown Anchorage to the Pow-wow grounds. Your donations may be sent or hand delivered to the Native Village of Eklutna, 26339 Eklutna Village Road, Chugiak Alaska 99567. Your donations are tax deductible pursuant to the Indian Tribal Government Tax Status Act (26 USC 7871 et seq.). We also encourage you to attend this historical event. Please join me and our Board as we celebrate this cultural event with the Native Village of Eklutna. The Alaska Construction Academies is a program started by the Associated General Contractors of Alaska to attract and train young people to work in construction. They also assist with hands on job training opportunities for individuals fresh from training. Jacob Ginn is an Alaska Native from Whittier who graduated from this program. 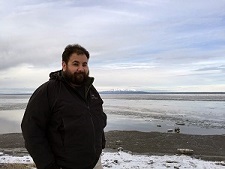 He started working for Eklutna Services, LLC on the Whittier Community School Renovation project in 2011, and has worked for us on several projects including PWSCC Wellness in Valdez, King Career Center CTE and the Maintenance and Operations Sand Storage Facility in Anchorage. Jake is featured on page 17 of this year’s A Blueprint for Success: Stories about Alaska Construction Academies Students and Employers in FY14. We’re proud of Jacob’s success and have linked a copy of A Blueprint for Success. The training that Jacob received from the Alaska Construction Academies was instrumental in his being hired. 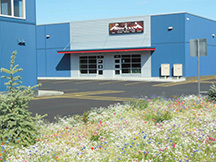 We encourage adults or students interested in working in construction to contact the Alaska Construction Academies in Anchorage at 907-569-4704 or on the web at www.alaskaca.org. Two major forces in Anchorage team up to continue to supply gravel for the Anchorage Market. Eklutna, Inc. the Native Corporation for Anchorage known for being the largest private landowner has teamed with Davis Constructors one of the state’s largest general contractors. Davis is known for building high rise office buildings in Midtown and recently formed a subsidiary called Mass Excavation, Inc. Eklutna, Inc. owns a subsidiary, Eklutna Services, LLC which has become a competitive force in the construction market.